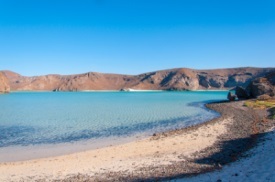 Located on a large bay on the Sea of Cortez, La Paz is a favorite beach area for both Mexican and foreign visitors. Shops are concentrated in a five-block area around the Malecon, La Paz’s seaside walkway. You will find a good selection of Mexican folk art, including wooden masks and lacquered boxes from Guerrero and black pottery from Oaxaca. Look for local artisans in their studios tucked away off the side streets, where you can purchase ceramics or woven wall hangings.